We publish our brief Newsletter during each of our exhibits to pass along information and reviews of the exhibit, photographic tips, selected images and news of other participation opportunities at Image City. We thank you for your interest and we look forward to another great year of fine photographs and events. We hope to see you at this, our final of the year, as well as each of our 13 shows in 2011. Best Wishes for the Holidays from all the folks at Image City! In this, our sixth Holiday Show at Image City, the gallery partners are exhibiting their work on the featured walls. 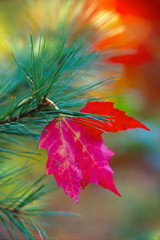 You will find a wide-ranging and varied collection of photographs, we enjoy the season with our exhibit selections. We are joined by Jim Patton and David Perlman in the East Gallery. We are pleased to have our neighbor, Tom Kroon, Financial Advisor, Edward Jones as an underwriter for the exhibit. Thank you Tom! Our talented Guest Photographers for the Holiday Show are also exhibiting an exceptional selection of their art. Guest Photographers in the show are D. G. Adams, Mark Bangs, Bruce Elling, Tim Fuss, Doug Lyttle, Scott Matyjaszek, Richard Mearns, John Solberg, Naushad UzZaman, and John Williamson. Award-winning photographs from Camera Rochester competitions are in an exhibition by club members Bev Cronkite, Marge Grinols, Michael Parisi, Alex Pendleton, David Ridley, and Gail Reviera. Gallery Partners are Daniel P. Crozet, Steve Levinson, Gil Maker, Don Menges, Dan Neuberger, Betsy Philips, Gary Thompson, Phyllis Thompson, Sheridan Vincent, and George Wallace. 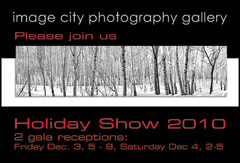 You will certainly enjoy viewing the photographs in the Holiday Show. Also, as you consider you holiday gift buying, please remember Image City where we have a wide selection of photographs, photo tiles and photo books -- certainly something special for your gift list. To make it a bit more convenient to visit during the pre-holiday, Image City will also be open on Monday and Tuesday. We will be closed from December 24 to January 4. We look forward to your visit. Regular visitors to the Gallery have learned to be on the lookout for "Peter's Picks", a popular feature at the Gallery. For each show, Peter writes a review on select photographs by our Guest Photographers. We have excerpts from his discussion here in the newsletter. You will want to go to the webpage link to see larger images and Peter's full write-up, or, certainly better, be sure to visit the gallery to see them in person. In selecting Mark Bangs' Tree of Life, Peter commented "This is a wonderfully seen and captured image, that although it adds a definite element of sadness and loss, it evokes both the power and majesty of nature. The stump of the tree is like a fixed point, expressing a deep emotion to be infinitely interpreted, with an aura of timelessness and serenity. The photograph has a compelling and meaningful abstract quality, one that nature has magically constructed, to illustrate a story that encompasses countless years of life, growth, and the ultimate passing of a giant in the forest. Who could not be entranced by the fascinating outline of the tree itself, carved by nature out of the very stump that gave it life, and nurtured it for generations to enjoy. 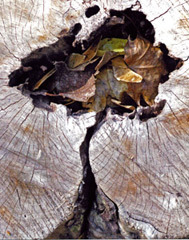 The curved tree trunk, lovingly carved out as though by water flowing through a deep gully, is emblematic that the tree itself, survived through many harsh times of wind, rain, and large temperature fluctuations....."
Peter next chose Last Show by Timothy J. Fuss -- "In his panel of dramatic and powerful B/W prints, the author has strikingly captured with visual vibrancy, the powerful and enigmatic relationship between the performer and the musical instrument, so much so, that we can hear and listen to the music emanating from each image. Timothy's photographs make bold, and some would say unconventional statements, that result in vital, creative, and thought-provoking images. Here, I am reminded what Ted Grant so famously said, namely, 'When you photograph people in color, you photograph their clothes, but when you photograph people in B/W, you photograph their souls". 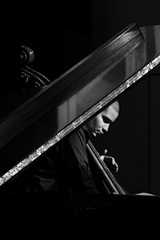 In the Last Show, the artist is impressively framed by the lid of the grand piano, and by deep-black areas of negative space. The powerful diagonals of the lid and the descending strings of the double bass, are entrancingly enriched by the majestic curves of the scroll of the instrument, and together, these features are wonderfully complemented by the artist's head, face, and left hand. Focusing in on the bass player, we are very aware of the casual folds of his open-necked shirt, which is in direct contrast to the rapt and deliberate attention of the musician......"
In selecting his print Burano, Italy, #485, Peter commented that "Scott Matyjaszek' quintessential collages impressively break through stereotypical perception, to give us superb 3-dimensional images, which are a delight to explore both visually and mentally. Whilst I admire and appreciate the consummate artistic skills of the author, it makes choosing one image to comment on extremely difficult, for I like all of them. I chose to highlight the two residences in Burano, namely, #'s 485 (shown at left) and 723, for besides being adjacent to each other on the panel, and having a dramatic hue difference, these collages evoke a very different feeling in this observer. With these assemblies being next to each other, the interplay of the bright red and green building facades is intriguingly emphasized. 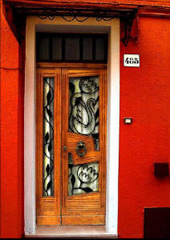 The visual antagonism of these perceptually opposite primary hues, forces the observer's eyes to constantly move from one collage to the other, resulting in visual and mental comparisons of each doorway. With #485, we are entranced by the strong, warm red color of the outside walls, but red is a danger sign, and the entranceway presents a less than inviting welcome....."
In Rick Mearn's Cloud Pressing, Peter found that "Rick's excellent and impressive images from the areas of the Grand Teton mountain range and the 'Badlands' of South Dakota are clear evidence why these venues are important attractions for landscape photographers. In his bio, he pays tribute to the work of the legendary Ansel Adams for pioneering such photography, so I thought I just had to include one of Ansel's celebrated statements, namely, 'Landscape photography is the supreme test of the photographer - and often the supreme disappointment.' There is certainly no disappointment here, for Rick has presented us with majestic examples of the above two areas in his splendid exhibition. 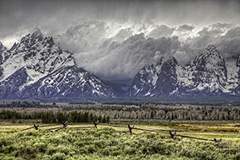 In Clouds Pressing, there is a power and majesty that strikingly shows the rugged grandeur and nobility of nature. The author waited for that memorable fleeting moment, when all the conditions were just right to give us a captivating and inspiring image. I particularly love the great 3-dimensional feeling that this print portrays...... "
With John Williamson's Captured Leaf, White Mountains, NH, Peter commented "Frank Lloyd Wright, the famous architect once said, 'Study nature, love nature, stay close to nature - it will never fail you.' These words could never be more appropriate as we admire and explore John's superb image. Life and impending departure has been magnificently captured in this vibrantly colored burst of nature's awesome power and beauty. Here we have an enthralling eruption of dramatic shapes and a kaleidoscope of warm shimmering colors, made all the more impressive by the author's use of a shallow depth of field, which isolates and emphasizes the principal components, whilst allowing the viewer to be very aware of the exquisite background. The pine needles intimate embrace of a fallen maple leaf, poignantly reminds us that with winter approaching, for many, life is fragile and often fleeting. One senses that the conifer tree is proudly extending the pine needles to temporarily capture the fallen leaf, and to thank it for being such a good neighbor, before the leaf finally glides to the earth below. The maple leaf, for its part, is magnificently attired with gorgeous reddish hues, colors which contrast so majestically with the deep saturated greens of the pine needles..... "
Each month, we have had a good turnout for Image City Critiques, our free program at the Gallery to provide participants an opportunity to engage in a friendly, constructive, and positive critique and review of their photographs. The sessions are held on the first Wednesday of the month. Join us for the next on Wednesday, January 5th from 7:00-9:00 pm. Please bring 2 or 3 jpg images or prints. Images may be on a CD or on a thumb drive and should be sized at most 1MB in size and at most 1500 pixels on the longest side. If you have any questions please contact Don Menges (dmenges@rochester.rr.com) or Gil Maker (gmaker@mac.com). We look forward to meeting with you on Wednesday, January 5 at 7pm. Brightly lit objects tend to project forward in images while dark objects tend to recede. Therefore, when making images it is effective to use brightly lit subject matter in foregrounds and to use darker colored areas as background. This can create the feeling of depth in our images. Portrait photographers provide good lighting for their subjects and often use dimly lit backgrounds. Macro photographers use good lighting on their subjects while utilizing darker shadow areas for their backgrounds. Wedding photographers pose brightly clothed groups of people in front of darker backgrounds. Landscape photographers use brightly lit foregrounds in front of darker middle and backgrounds. In each of these examples the photographer communicates depth by making their subject matter pop forward while their backgrounds recede. 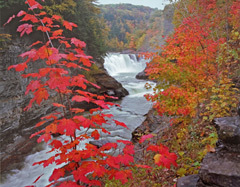 In my example image, that I title Vriginia Creeper at the Lower Falls and taken at Letchworth State Park, my basic subject matter was the falls. Fortunately the background cliffs of the other side of the river were dark, and the natural light of the scene produced good separation between the bright falls and the darker cliff background. The challenge then became to find a foreground that could separate from the brightly lit middle ground falls. In working the scene I searched for a colorful, brightly lit foreground that could project forward and create some contrast and depth separation from the falls. Fortunately, I was able to find some bright red leaves of Virginia Creeper amongst some other well lit green leaves. I then composed the image using the Virginia Creeper as foreground, the falls as the middle ground, and the cliffs as background. Another alternative could have been to use a silhouette type of foreground in front of the falls, but I believe that in this instance the brightly lit foreground provides a better perception of depth and therefore more effectively communicates my feelings when I was making the image.